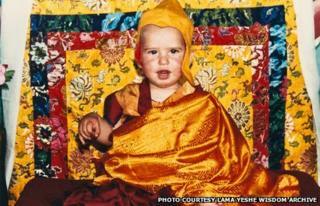 A Spanish toddler identified as the reincarnation of a revered Buddhist lama spent his entire childhood in an Indian monastery. But at the age of 18 he returned to his family in Spain. Still hailed as a teacher, he is more comfortable on the beaches of Ibiza. When he was two, Osel Hita Torres was enthroned as a reincarnated Tibetan Buddhist lama. He was dressed in robes and a yellow hat. Grown men prostrated themselves in front of him and asked for his blessing. No-one was allowed to show him affection unless he initiated it. He had his own special cutlery. "It must have been tempting to take advantage of that sometimes and act badly," I say to him now. "Yes," he replies. "I was a tyrant and an obnoxious spoiled brat. I was pretty bossy, let's say." Even by Tibetan Buddhist standards, two was a young age for enthronement, and Osel was not even Tibetan - he is Spanish. We are speaking in Ibiza, in the courtyard to his mother's villa. Osel is 27 and no longer a lama. He has swapped the rigours of monastic life for playing the drums on the beach, and chilling to trance music. He is not sure he is still a Buddhist. Because of his bad experiences with the media, he hardly ever gives interviews. But he is relaxed and charming to me, and philosophical about his extraordinary history. He was born in Granada, the fifth child of Maria Torres. Maria had converted to Buddhism and was a follower of Thubten Yeshe, a charismatic and extrovert Tibetan lama who was travelling the West in the 1970s. Yeshe was no ordinary lama. He visited Disneyland and was half in love with Western culture. His young Western disciples were drawn by his Eastern exoticism. Some believed he could read their minds. But Lama Yeshe had heart problems, and he died in 1984 in a Los Angeles hospital, aged 49. His followers were distraught. A few months later, Maria became pregnant with Osel. In Tibetan Buddhism, lamas who achieved a high level of enlightenment are able to choose what happens after their death - whether to be reincarnated and, if so, where. The conviction grew among Lama Yeshe's followers and former colleagues that Yeshe had chosen to be reincarnated in Spain, in little Osel. They detected in Osel a certain meditative self-containment. The way he acted reminded them of Yeshe. A baby like Osel appeared in another lama's dreams. Osel was taken to India for testing, where he picked out Lama Yeshe's former possessions, including his sunglasses. The Dalai Lama confirmed that Osel was Lama Yeshe's reincarnation. The four noble truths contain the essence of the Buddha's teachings. It was these four principles that the Buddha came to understand during his meditation under the bodhi tree. The Buddha is often compared to a physician. In the first two noble truths he diagnosed the problem (suffering) and identified its cause. The third Noble Truth is the realisation that there is a cure. The fourth noble truth, in which the Buddha set out the Eightfold Path, is the prescription, the way to achieve a release from suffering. Osel went to live in a monastery in southern India and had little contact with his parents. It was a strange way to treat a toddler but Osel feels no resentment. "For them it wasn't something negative, it was a huge opportunity they were giving the kid, like he's going to Yale or Oxford." I met Maria at a Buddhist temple on Ibiza. I put it to her that her name is appropriate for the mother of a God. She does not reject the idea. "At the beginning, yes, it was something like this." The fact that Lama Yeshe had come back in her son was good news. "It was a reason for celebrating. It made me feel very special, the fact that he had chosen me as his mother. I thought that I was not going to have any more suffering during my life, just because of that. I wanted to share my son with the rest of the world, because it's not my son." But did she not miss him? She says she was not clingy. "Maybe because I don't really need to have my children by my side all my time, it was something I could deal with very easily." But having a lama in the family was disruptive for her other five children as they all travelled the world, trying to stay reasonably close to Osel when he was very small. Osel's Western disciples barely saw him as a little child at all. They detected in him wisdom, compassion and a detachment from emotional needs that allowed him to develop on a spiritual path - and stopped him missing his parents. "When you were treated in this very deferential way, how much did you think to yourself secretly 'This is crazy'?" I ask him. "For me it was completely normal," he says. When he was nine, he sent a cassette tape to his mother where he pleaded to be allowed to come back to Spain. Instead his father, Paco, went to live in the monastery with him, and his younger brother, Kunkyen, went to join him as a monk. "When I turned 16-17, I was dying to get out." The turning point came when he read Herman Hesse's Siddhartha, and he started to wonder whether he was a true Buddhist. On his 18th birthday, he had a momentous conversation with his mother, which she described to me. "He said to me, 'If I decide not to go back to the monastery, can someone force me to go back?'" "No", she told him. "Well, I'm not going back," he said. But the monastery wanted him to return. "I got a huge amount of letters and phone calls, and people coming to visit me, just telling me that I made a big mistake, that I lost a huge opportunity, that was my destiny, my purpose, blah-blah-blah, whatever." Maria was also put under pressure but she supported his decision, and still does. Life outside the monastery was difficult for him to start with - discos and girls were baffling and scary. One of his Buddhist sponsors living in Canada arranged for him to go to school there. He then went to Madrid where he did a degree in film studies. He would like to become a documentary maker. Sometimes Osel seems like a living disproof of the old Jesuit saying, "Give me a child until he is seven and I will give you the man." The Tibetans had him from two till 18, but the pull of the West was stronger. "What music do you like?" I ask him. "Reggae, I like drum-and-bass, I like trance, psychedelic trance, stuff like that. Hip-hop also." In Lama Yeshe's organisation, the Foundation for the Preservation of the Mahayana Tradition (FPMT), they still see him as a teacher. He tries to accommodate them with what wisdom he can muster, but his advice tends to be light on Buddhist theology, with generic suggestions like, "When we see people in the centre, it's nice to always say hello." His future is uncertain, caught between cultures and traditions. He lives on Ibiza but Spanish is only his third language, after Tibetan and English. He has taught Tibetan classes, he doesn't have a full time job but has been making a documentary for the FPMT. He and Kunkyen feature on a recording that combines Tibetan chanting with Western trance music. He seems to be moving back towards the FPMT and even talks about returning to head the organisation. "Maybe when the spiritual director decides to retire, then I can take over." "I'll probably just be maybe the co-ordinator. Not spiritual. I don't know, maybe some day. Slowly I am getting some interest towards Buddhism." Maria is still a convinced Buddhist. "Do you still think he's a reincarnated lama?" I ask. "Yes," she says. "What he isn't, is a traditional lama and it is what he doesn't want to be." She has no regrets. "I never ask this question to myself, because it's not possible to go back. I always think everything has sense. What's happening now is the best it can happen, because it's what's happening." Buddhists do not really do regret. Osel himself still believes in reincarnation, and that Lama Yeshe could have chosen whose body he would come back in. He is just not sure it is him. "Are there ever occasions when you feel a little bit of Lama Yeshe in you?" I ask. "Yes, sometimes," he says. "Sometimes I ask Lama Yeshe to give me a message or a sign or something. And many times he does give me a sign or a message. "So I don't know if he's outside or if he's inside. I don't know, but he's one of my best friends." The Reluctant Lama will be broadcast on Friday 28 September at 11:00 BST on BBC Radio 4. Or catch up later on the BBC iPlayer.